Those comments are just the beginning of what Ethan Moreau shared during a conversation with MayorsManor a few days ago. About a week prior, word came out that the former Oilers captain had retired and taken a scouting position with the Montreal Canadiens. But any attempt to look forward was intertwined with the events of last season. And, much of our conversation became the first acknowledgement of what had privately been known since December, the gritty forward wouldn’t be returning to the ice. So, what happened exactly? That’s something many have asked in various forms since he was put on waivers last December. 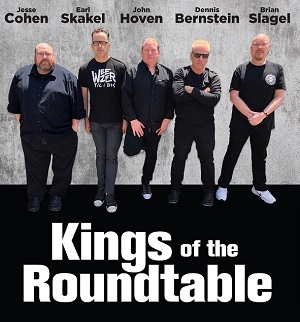 Now, with the Kings regular season and playoff run complete, Ethan sat down with us for an exclusive interview and shared several previously unreleased details of the story. 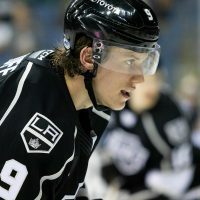 To properly frame things, he was ecstatic to sign in LA last August for several reasons, including – he knew many of the Kings from training with them over the past few summers, his brother lives in LA, he was being reunited with two players he went to the Stanley Cup Final with in 2006 (Matt Greene and Jarret Stoll) and he thought the Kings provided him an excellent chance to make one last deep run through the NHL playoffs. Known as much for being a great guy in the room as his leadership on the ice, he instantly went to work – calling out Greene and Dustin Penner before training camp even opened, claiming the only reason either were funny is that they stole all of his material when they left Edmonton. The banter between the three became common pre-season fodder on MayorsManor. However, putting jokes aside, Moreau didn’t provide the offensive production he had hoped for once the season got started. Primarily a gritty, sandpaper-type guy, the former number one draft pick wasn’t expecting to have just a single assist though the first 16 games. 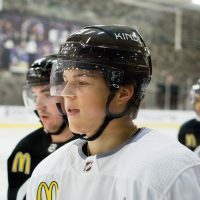 On November 28, Moreau scored his first (and only goal) with the Kings. Just four games later, he received only 6:39 of ice time (his second lowest of the season) in a game vs. Minnesota…and later that night came the news. 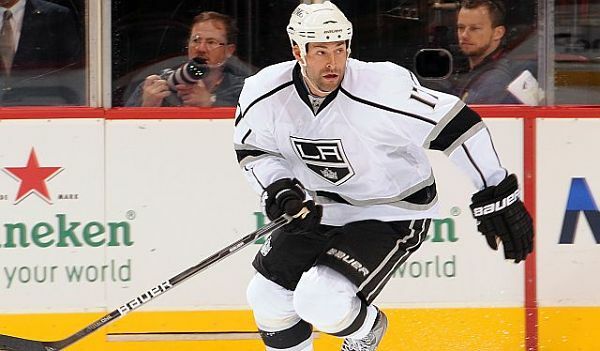 Regardless, after clearing waivers, he had a decision to make – go play in the AHL or retire. “I had some health issues that I was playing with. In my mind, I was willing to keep playing with injuries in the NHL, but I wasn’t really thrilled with the idea of doing it at a step down. It’s hard for a player who’s played as long as I have. It’s tough on your ego. It’s tough on everything. So, they gave me some time to contemplate what I wanted to do. The recommendation to retire came after he failed the baseline concussion test twice in Manchester, something that wasn’t reported at the time. 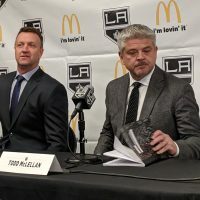 Adding a layer of complexity to the decision was the fact the Kings replaced coach Terry Murray right as Moreau was receiving some of his key medical opinions. 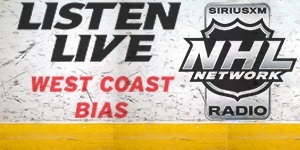 Enter Darryl Sutter – a man Moreau has had tremendous respect for since his days in Chicago. He also played on a line with Darryl’s brother Brent during his rookie season. Thus, the hockey player in Moreau thought there might be an opportunity to return to the Kings once again. At the end of January Sutter made a scouting trip to Manchester and a few weeks later Dwight King and Jordan Nolan were called up to LA. Both players just won a Stanley Cup with the Kings, something that still stings when Moreau is honest with himself. Among the many things he cherishes these days is a closeness with several former teammates. 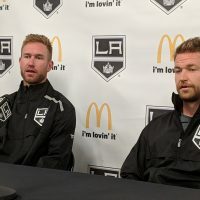 True to his word, Moreau wasn’t around when Dustin Brown brought the Stanley Cup by his brother’s office earlier this week (note: Chad Moreau works with several NHL players and was formerly the Oilers’ Strength and Conditioning Coach). Even with his time as a King now over, he doesn’t blame the organization for how things were handled. He also doesn’t have any regrets about signing with the Kings. From Huntsville, Ontario – a few hours outside of Toronto -to Orillia, Niagara Falls, Sudbury, Indianapolis, Chicago, Edmonton, Columbus and then LA, it’s been a never ending hockey journey for Moreau and his family. Along the way, he’s picked up many accolades and honors – including receiving the NHL’s King Clancy Award in 2009 (given annually to the player who best exemplifies leadership qualities and has made noteworthy contributions in the community) and being named the Oilers’ team MVP in 2004 (coming off his best NHL season, with 20 goals). Yet, he won’t be needing his stick or skates for this next phase. Last summer he switched agents, joining Pat Brisson and CAA. The team there, along with his wife Ornella – who’s been by his side for 20 years, since he was playing junior hockey in the OHL – have supported him throughout the process. Why Montreal? Moreau was blunt, “They were the first team that contacted me.” He also credits some mutual friends for connecting him to Canadiens’ GM Marc Bergevin. It must be true…when one door closes, another opens. Best of luck to ya, Ethan! What a fantastic read. Thank you for answering some question Kings fans have had all season. Best of luck to you in the future, Ethan. Great in depth article. This is why The Mayor is great. Many people would not consider this Kings worthy news, but it is great to hear about a great guy from the Kings landing on his feet. Quality people always find a way to be successful. Mayor the constant professional. Thanks for information, I thought it was always going to be a gray area. I’ve been a fan of Ethan Moreau’s since his rookie season in Chicago. Though I’m still a faithful Hawks fan, I’ve kept tabs on him throughout his career. Thank you for this article – very excited for him and the next phase of his career! Best of luck, Ethan! Very good read, and I can only imagine his “awkward” situation (Moreau’s word) at the Cup in LA when things worked with less fortune this season. But respect for knowing when it’s time to walk away, and even MORE respect for one of those unsung-heroes you remember through his career. The kind of guy that pissed you off when he played for the Oil or Blackhawks and thwarted our best players on this night or that. Hats off, Ethan. I remember your career and presence, and have mad respect for terrific character, as you showed through your career. Even with all the fan support for Ethan, I think if he was such a great guy that he would have stepped down much sooner. He kept a spot on the Monarchs roster all season when he could have given that spot up for someone who wanted to be here. He did not seem to attend a single team function and did not seem to attend a single game. He was a sore loser in being sent down and not accepting sooner his inability to play. He hung on in the event that his pal Sutter would bring him back to Manchester when his real opportunity to get back to LA was to play some serious hockey. If he was having the medical issues and trying to think about a return to professional level hockey he would have had to play here in Manchester. It just all around to me shows that a large part of his medical condition was created by a swollen ego. I wish him the best, he was a great hockey player and I enjoyed his grit. I just wish that when it was time to leave the game, he would have do so with a bit more unselfish behavior. Appreciate the story and enjoyed it as I do all the Mayors stuff but just still sets wrong with me on how he treated the Monarchs.